Right across from Okinawa World (also known as Gyokusendo) lies another world filled with the fascinating and the unusual. It is called Gangala. Unusual rock formations, giant caverns, and strange looking trees are the highlights in this very interesting-to-see place. 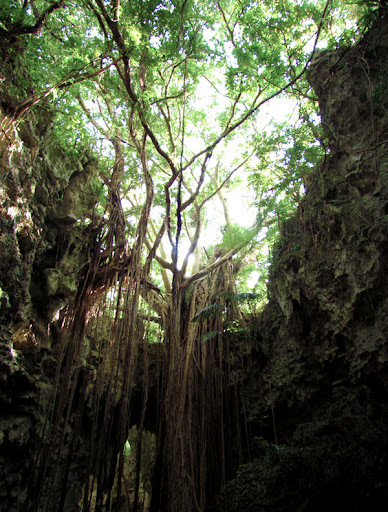 Its most recognizable feature (seen above) is that of a giant Banyan Tree, or Gajimaru Tree, in which its roots descend deep into an open cavity. Access inside this attraction is currently on a reservation basis only. It is approximately an 1hr and half guided tour through some of Okinawa's most unusual looking natural terrain. See photo album above or click here for more pictures. The tour is mainly in Japanese, but they do offer an English handout that helps explain some of the stations you will stop at (handouts must be turned in after the tour). Excavations continue at the 'Valley of Gangala' (its official title). It is believed that the first inhabitants lived in this area some 18,000 years ago. These inhabitants are referred to as the 'Minatogawa People' residing during the Paleolithic era. Highlights of the tour. 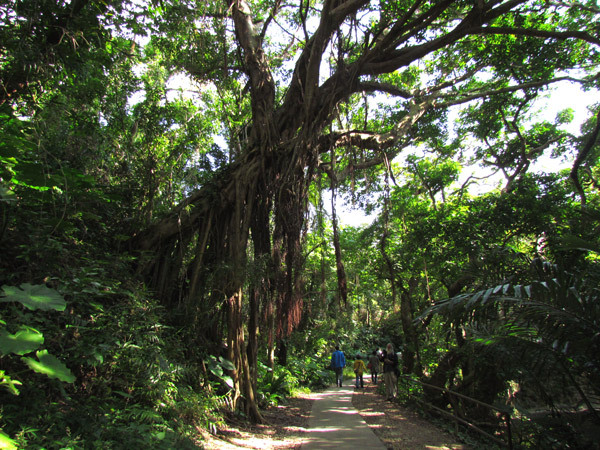 One of the highlights you will see is the 'Walking Bayan Tree'. The nickname was given because each new root that grew extended itself down below creating another 'leg' on the ground, thus extending its growth outward and giving the impression that the tree is moving or 'walking'. Inagudo Cave (female cave). It is believe that a female goddess lives in this cave. People come here to pray for a prosperous relationship and inside lies a certain rock that resembles that of a female figure. The cave is not accessible for passage. 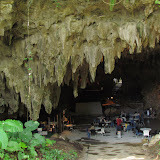 Ikigado Cave (male cave). 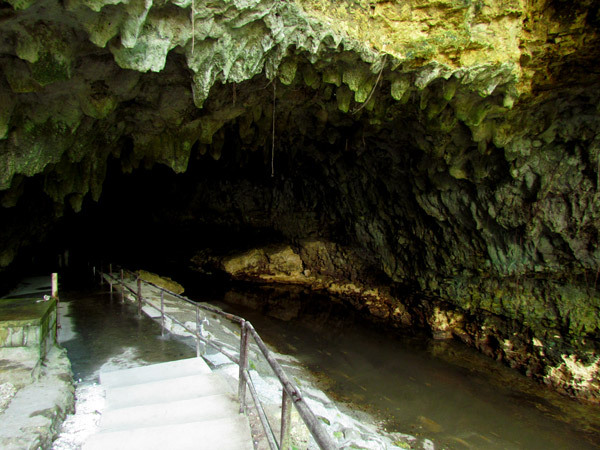 This is a much larger cave that people can walk inside. It is believed that a male god resides here. It is believed that people between 200-300 years came here to pray for fertility. Ufushu Gajimaru. The Ufushu Gajimaru (seen above) is often seen in promotional advertisements. It is estimated to be over 150 years old. Its roots hang down long giving it the visual perception that it is much larger than it really is. It is the hallmark feature of the tour. Origin of the name. It is said the name Gangala came from a sound that a rock would make when it fell down some of the deep chasms here in this area. It would sound like “gangala gangala”. Making Reservations. You have to call and make reservations at least a day ahead. Space is limited. There are 4 guided tours throughout the day; 10am, 1200pm, 1400, 1600. Phone number is 098 948 4192. See website (Japanese only) for current schedule. There may or may not be an English speaking staff when you call. Price. Check their website for current prices http://gangala.com/chargeaccess.php. At the time of this post. Adults were 2000 Yen per. Junior high and high school students 1500 Yen. Elementary students and below accompanied by a parent are admission free. Arrival. Please arrive about 15 minutes early and check in. There is a cafe in entrance area (cave). A tour guide will come out an read off names when it comes time to depart. Tour length. 1hr and half. Tour ends inside Okinawa World. Strollers/Wheel chairs. Though there are many flat areas throughout the tour, they do not advertise the location as stoller and wheelchair accessible. There are areas of uneven ground and with stairways. Phone number: 098 948 4192. Directions. Gangala is right across from Okinawa World. Look for signs that say Valley of Gangala. Parking is available. The most straight forward directions to Gangala is to take Highway 58 into Naha City and then take Highway 329 going east. Next, go south on Highway 507 and then turn onto Highway 131. See map for further directions. 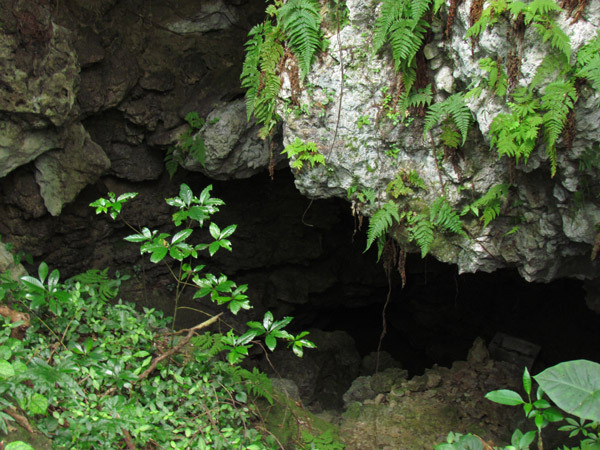 Other publicly known caves of Okinawa. 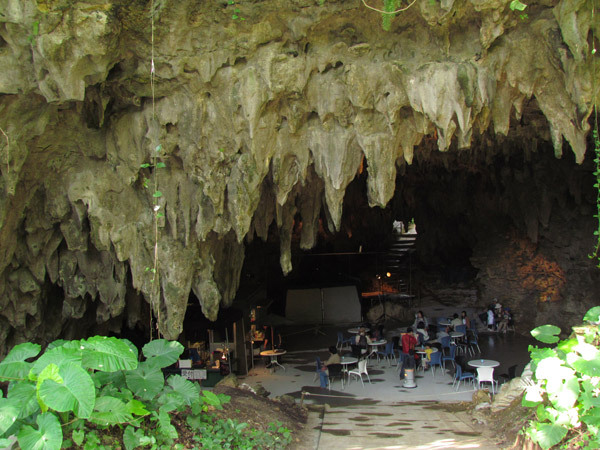 Futenma Shrine and Cave (Ginowan City), Gold Hall (Kin Town), Kin Kannonji Temple (Kin Town), Yabuchi Cave Ruins (Uruma City).